My posts on this particular project so far have been about preparation for generating a plausible political landscape complete with infrastructure rather than the physical landscape most of my other projects have focussed on but before I go any further I think it necessary to have at least enough of a physical landscape to make placement and routing of the more man made features interesting..putting things on a flat coloured sphere is only going to hold my attention for so long I expect! 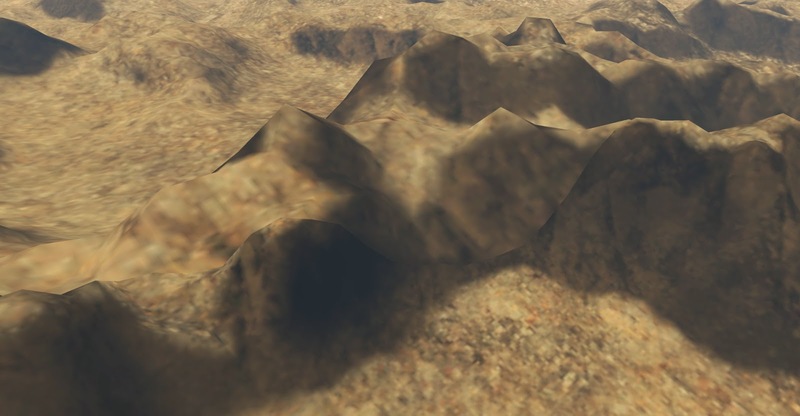 While I've previously worked with voxels to facilitate truly three dimensional terrain including caves and the like with the focus of this project elsewhere the simplicity of a heightfield based terrain makes sense. When doing this in the past I've used a distorted subdivided cube as the basis of the planet - taking each point and normalising it's distance from the planet centre to produce a sphere - which has some benefits for ease of navigation around each "face" and for producing a natural mapping for 2D co-ordinates but the stretching produced towards where the cube faces meet is unpleasant and besides, I've done that before. Caveat: Before I go any further however I should point out that nothing I am doing here is rocket science - if you have ever done your own terrain projects in the past the odds are nothing here is news to you but I'm presenting what I'm doing as it will hopefully form the basis for more interesting things to come or if you're thinking about a terrain project for the first time perhaps it will be of use. 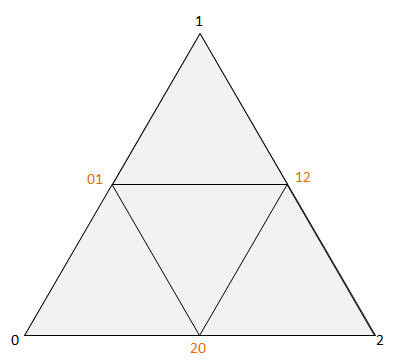 Subdividing an equilateral triangle into four for the next level of detail produces three new vertices and four triangles to replace the original one. This is about as simple a scheme as you can get and can be found in many terrain projects, but simplicity is what I'm after here so it's perfectly suited. As modern graphics hardware likes to be given large numbers of triangles with each draw call rather than render single terrain triangles the basic unit I render (which I'm calling A Patch) is a triangle that's already been subdivided eight times, producing an equilateral triangle shaped chunk of geometry that has 256 triangles along each edge - a total of 65,536 triangles which should feed the GPU nicely especially as they are drawn as a single tri-strip. Were I to draw the entire planet at my lowest level of detail then I would be drawing 20 of these patches giving around 1.3 million triangles which empirical testing has shown my GPU eats up without pausing for breath. Good start. As the viewpoint moves towards the planet's surface then I need to subdivide further and further to get down to a usable level of detail, but by then the triangle count would probably be too much to even store in memory never mind render were I to try to render the entire planet at that detail so of course some sort of level of detail scheme is required. In keeping with my general approach the scheme I'm using is simple, when rendering I start by adding the 20 base patches mentioned above to a working set of candidates for rendering, then while that set isn't empty I take patches out of it and first test them for visibility against the view frustum then again against the planet's horizon in case they are effectively on the back side of the planet. If either of those tests fail I can throw the patch away, but if both pass I then calculate how far away from the viewpoint it's centroid is and if less than a certain factor of the patch's radius I subdivide it into four patches at the next level of detail and add those into the set of patches for further consideration. If the patch is not near enough to the viewpoint to be subdivided I add it to the set of patches to render. 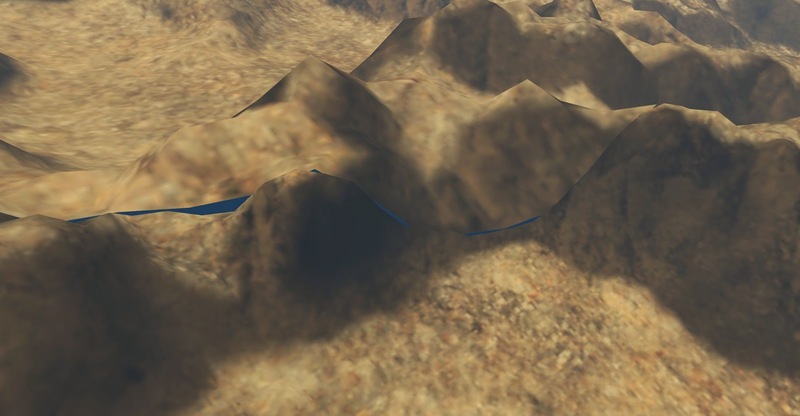 The end result is a set of patches where near to the viewpoint are increasingly subdivided patches - i.e higher LOD each covering a smaller area at a higher fidelity - while moving away from the viewpoint are progressively lower LOD level patches each covering larger areas of the terrain at lower fidelity. The ultimate goal is to provide a roughly uniform triangle size on screen across all rendered patches, note that this is intentionally a pretty basic system with no support for more advanced features such as geomorphing so the LODs pop when they transition but it's good enough for my purposes. Closer still and we have a high detail level with even more high detail patches being used. 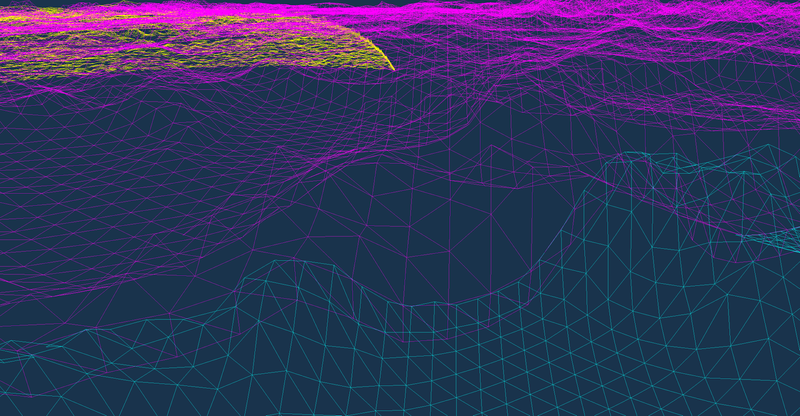 5.7 Million triangles are being rendered here with the ones near the viewpoint almost a pixel in size. In theory this value could be changed on the fly as the frame rate varies due to rendering load to try to maintain an acceptable frame rate, but I just set it to a decent fixed value for my particular PC/GPU for now. 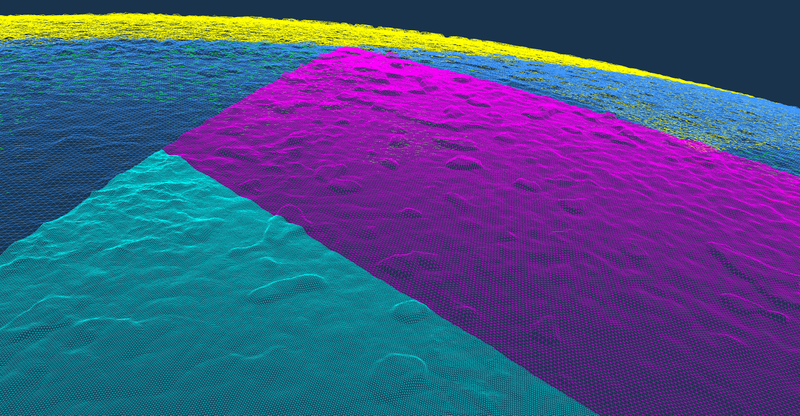 As anyone who has worked with terrain LODs before will tell you however this is only part of the solution, where patches of different LODs meet you can get cracks in the final image due to there being more vertices along the edge of the higher LOD geometry than along the edge of the lower LOD geometry. If one of these vertices is at a significantly different position to the equivalent interpolated position on the edge of the lower LOD geometry there will be a gap. Note that as the higher LOD geometry is typically closer to the viewpoint you only tend to see these in practice where the vertex is lower than the interpolated position otherwise the crack is facing away from the viewpoint and is hidden. There are various ways to tackle this problem, one I've used before is to have different geometry or vertex positions along the edges of higher LOD patches where they meet lower LOD patches so the geometry lines up, but this adds complexity to the patch generation and rendering, and in it's simplest form at least limits the LODing system to only support changing one level of LOD between adjacent patches. For this project I've taken a different approach and rather than changing the connecting geometry I generate and render narrow skirts around the edges of each patch. These are the width of one triangle step, travel down towards the centre of the planet and are normally invisible but where a crack would exist their presence fills that gap hiding it with pixels that while not strictly correct are good enough approximations to be invisible to the eye. The pixels aren't correct as they are textured with the colours from the skirt's connecting edge on the patch so are a stretchy smear of vertical colour bars but like I say they are close enough, especially as the gaps are usually just a pixel or two in size when using reasonably dense geometry. With one triangle wide skirts on the patches the gaps are filled with pixels close enough to the surface of the patches in colour that they become invisible to the eye. Wireframe when rendering the patch skirts shows the additional strip of geometry pointing straight down from the edge of the lower detail patch. The higher detail patch also has a skirt but here they are back facing and culled by the GPU. This does of course add extra geometry to each patch (1536 triangles in my case with 256 tris along each patch edge) which I am always rendering regardless of the LOD transition situation to enable them to be sent with the same single draw call per patch, but this is a small GPU overhead and doesn't appear to have any practical effect on performance. 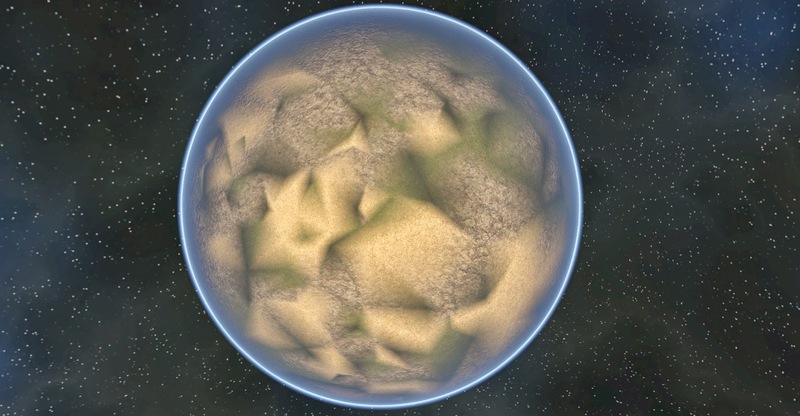 Anyone who's had a go at rendering planets will almost certainly have encountered the hidden evil of floating point precision. Our GPUs work primarily in single precision floating point which is fine for most purposes but when we're talking about representing something tens of thousands of kilometres across down to a resolution of a centimetre or two the six or so significant digits offered is simply not enough. This typically shows up as wriggly vertices or texture co-ordinates as the viewpoint moves closer to the surface, certainly not desirable. To avoid this I store the single precision vertices for each patch not relative to the centre of the planet but relative to the centre of the patch itself. The position of this per-patch centre point is stored in double precision for accuracy which is then used in conjunction with the double precision viewpoint position and other parameters to produce a single precision world-view-projection matrix with the viewpoint at the origin. That final point is significant, by putting the viewpoint at the world origin for rendering I ensure the maximum precision is available in the all important region closest to the viewer. 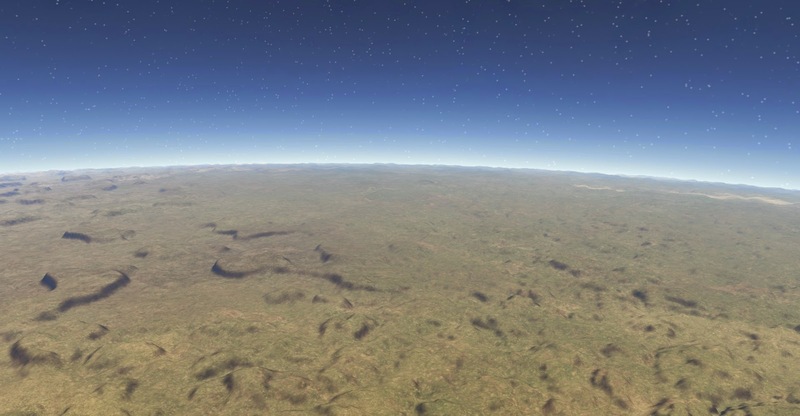 So now I have a reasonable way to render my planet's terrain geometry viewed anywhere from orbital distances down to just a metre or so from the ground I need to generate a heightfield representative enough of real world terrain to make placement of settlements and their infrastructure plausible. I've played around with stitching together real world DEM data before but have never been too happy with the results, especially when trying to blend chunks together or hide their seams, so for this project I'm sticking to a purely noise based solution for the basic heightfield. as I have a huge number of samples to generate. 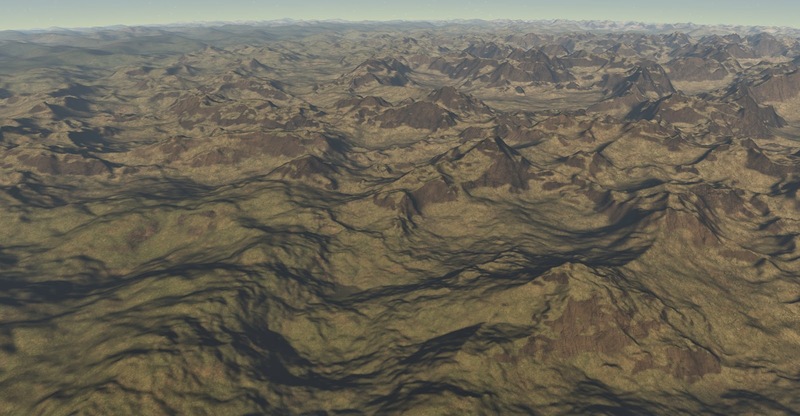 A common feature of purely noise based heightfields however that you see frequently on terrain projects is that they tend to look very homogeneous with very similar hills and valleys everywhere you look. To make my planet more interesting I wanted to try to get away from this so had a think about how to introduce more variety. The solution I came up with was to implement a suite of distinct heightfield generators each using a combination of noise modules to produce a certain type of terrain. As a starting point I went with mountainous, hilly, lowlands, mesas and desert, but how to decide which terrain type to use where? One solution would be to use yet another noise function to drive the selection, but I thought it would be interesting to try something else, and ideally a solution that gave me more control over the placement of different terrains while still providing variety. The control aspect would allow me to make general provisions for placement such as having deserts more around the equator or mountains around the poles which feels useful. This doesn't violate my basic tenet of procedural generation - procedural isn't the same as random remember. Instead of noise then I chose to use a control net similar to the country one detailed in my previous post, but instead of country IDs this time I put a terrain type on each control point - I also use the direct triangulation of the control net rather than the dual. Shooting a ray from the planet's surface against this terrain control net gives me three terrain types from the vertices of the intersected triangle while taking the barycentric co-ordinates of the intersection point gives blending weight for combining them. The terrain type control net. Each vertex has a terrain type assigned to it so any point on the surface can be represented as a weighted combination of up to three terrain types. 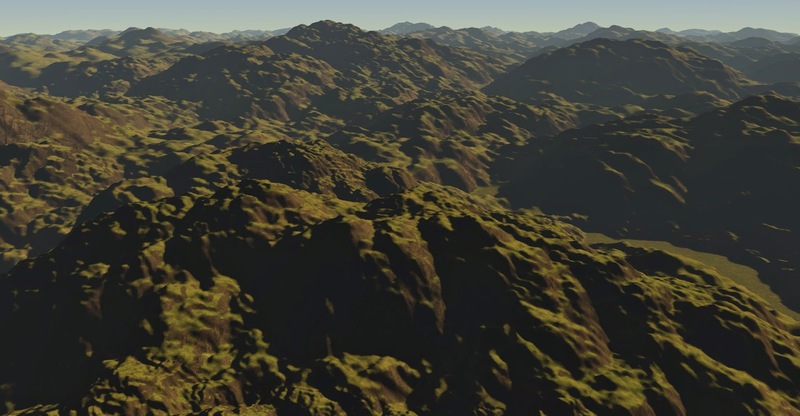 Taking the result of each of these terrain type's heightfield generators, scaling by their blending weights then adding them together gives the final heightfield value. 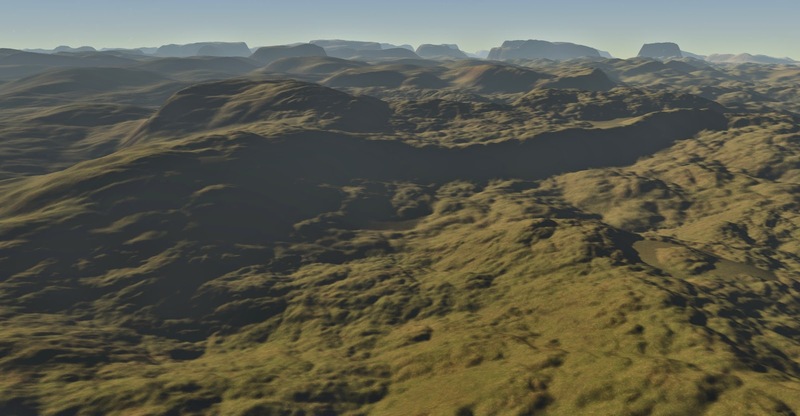 There is an obvious optimisation here too where a triangle has the same terrain type at two or more of it's vertices - the heightfield generator for that terrain type can be run just once and the blending weights simply added together. 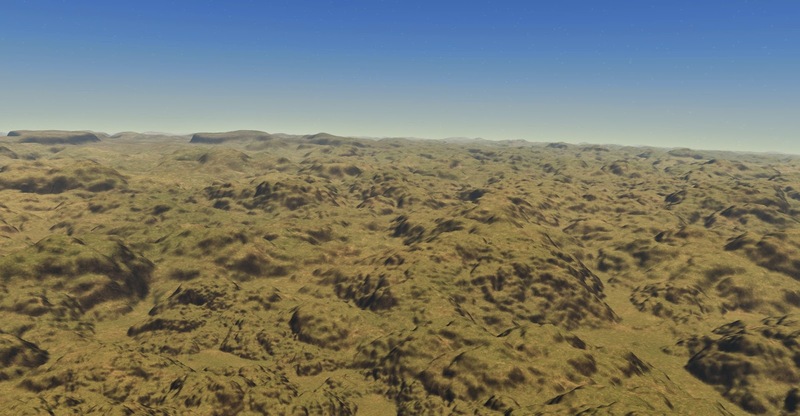 I quite liked the idea of being able to craft each type of terrain separately so the look of the lowlands can for example be tweaked without affecting the mountains which can sometimes be tricky with monolithic noise systems, the frequency of terrain changes and their locations can also be controlled by changing the density of the terrain control net or playing with the assignment of terrain types to the control points. For now I'm just assigning types randomly to each point but you could for example use the latitude and longitude of the point as an input to the choice or assign initial points then do some copying between adjacent points to produce more homogeneous areas where desired. 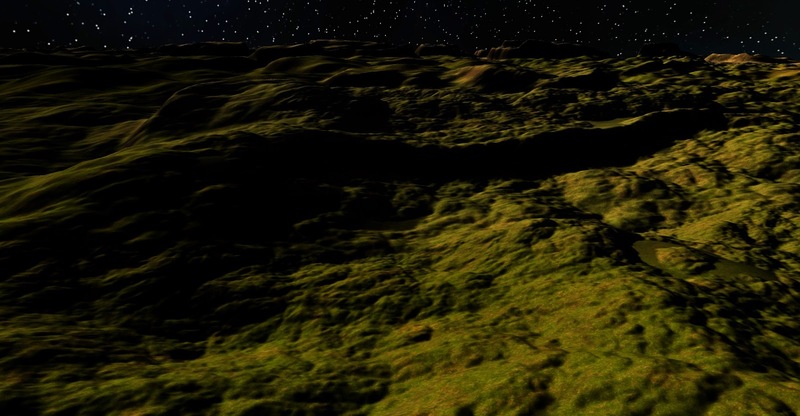 An interesting heightfield is all well and good and whiled I've stated that physical terrain is not really the focus of this project I do want it to look good enough to be visually pleasing. 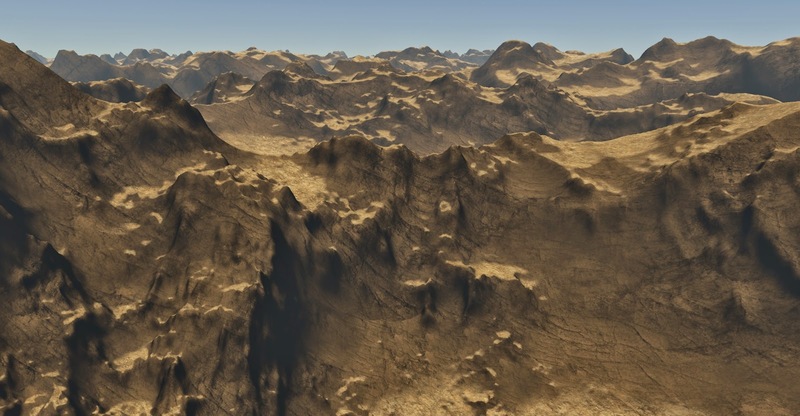 To this end I did want to spend at least some time on the texturing for the terrain so my desert could look different to my lowlands and my mesas different to my alpine mountains. 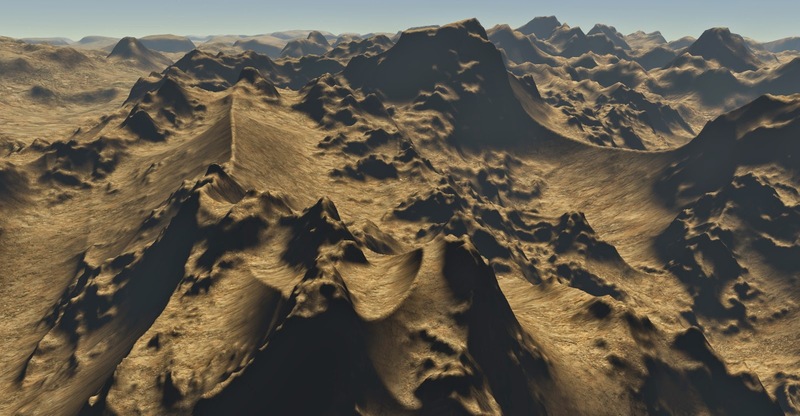 Past experience has shown me that one of the more problematic areas with texturing is where the different types of terrain meet, producing realistic transitions without an exorbitantly expensive pixel shader can be tricky. The texturing also needs to work on all aspects of the geometry regardless of which side of the planet it's on or how steep the slope. The latter problem is solved by using a triplanar texture blend, using the world space co-ordinates of the point to sample the texture once each in the XY, ZY and XZ planes and blending the results together using the normal. This avoids the stretching often seen in textures on heightfields especially when not mapped on to spheres when a single planar projection is used but does of course take three times as many texture sample operations. 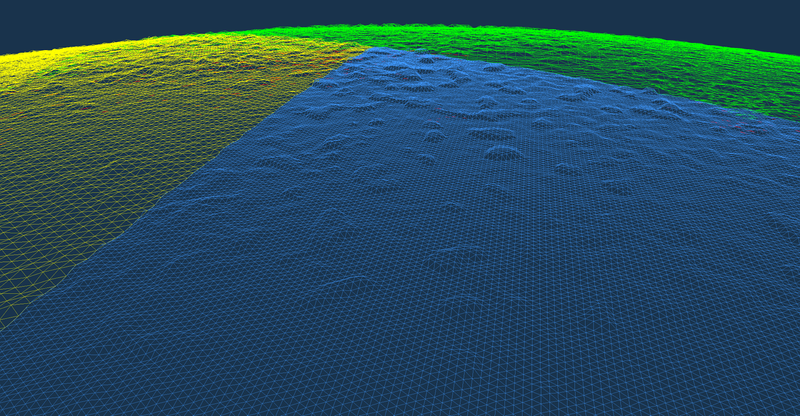 If you look closely you can also see the blend on geometry furthest from aligning with the orthogonal planes but as terrain textures tend to be quite noisy this isn't generally a problem - and is certainly less objectionable than the single plane stretching. The solution is to perform all three single plane mappings and use the world space normal to perform a weighted combination of all three. Although this requires three times as many texture reads the stretching artifacts are all but gone. As for which texture to use at each point I've adopted something of a brute force approach. 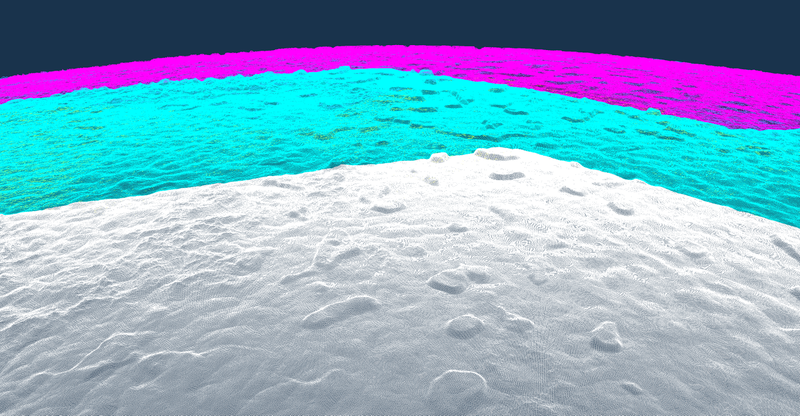 By keeping the palette of terrain textures relatively limited I am able to store a weight for each one on each vertex, in my case eight textures so the weights can be stored as two 32bit values on each vertex. 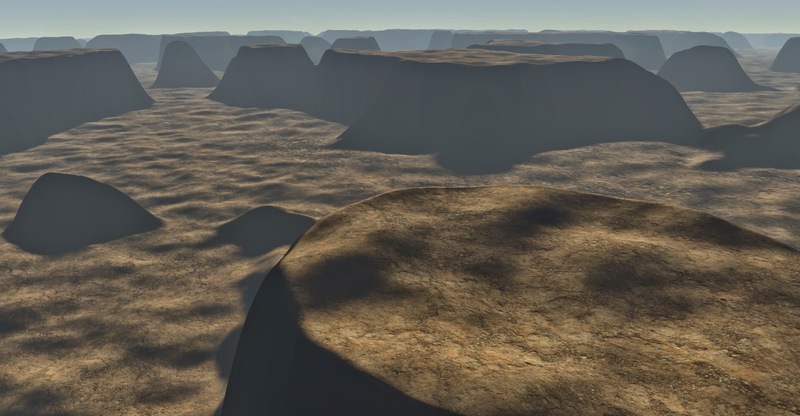 The textures I've chosen are designed to give me a decent spread of terrain types, so they include for example two types of grassland, snow, desert sand and rocky dirt. By storing a weight for each texture independently I avoid any interpolation problems where textures meet as every texture is essentially present everywhere. It does of course mean that the pixel shader in theory will need to perform up to eight triplanar texture mappings each requiring three texture reads (twice that if normal mapping is supported) but in practice most pixels are affected by only a couple of textures. If I was doing this in a more serious production environment I would be thinking about having several variations of the pixel shader each specialised for a certain number and combination of textures to avoid potentially expensive conditionals or redundant texture reads but as this is just a play project one general purpose shader will suffice. 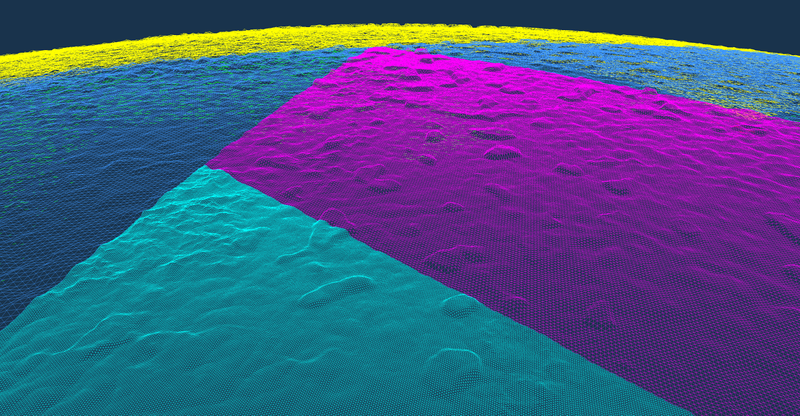 While the textures blend together here the shape of the terrain control net is still quite obvious. To improve matters I fell back to a technique I first trialled while playing with the country generation code, by perturbing the direction of the ray fired from the surface against the terrain control net more variety can be included while still offering the controllability of the net. I'm particularly happy with how this looks from orbital distances but it will suffice closer to the surface for now as well. In a previous project I implemented the system published in Precomputed Atmospheric Scattering by Eric Bruneton and Fabrice Neyret which produced excellent results, but in the spirit of trying new things I thought for this project I would try Accurate Atmospheric Scattering by Sean O'Neil found in the book GPU Gems 2. This looked like it might be a bit lighter weight in performance terms and easier to tweak for custom effects. I found the O'Neil paper relatively straightforward to implement which was refreshing after some papers I've struggled through in the past and it didn't take too long to get something up and running. 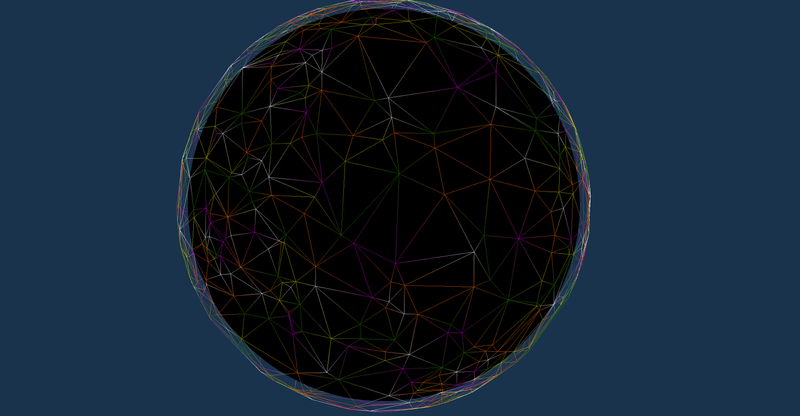 The only thing I changed was to move all the work into the pixel shader rather than doing some in the vertex shader. 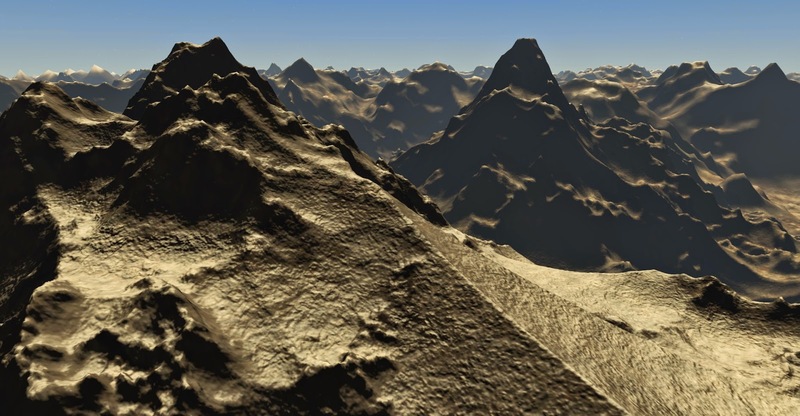 There were two reasons for this, the first being that when applied to the terrain the geometry is quite dense so the performance cost implication should be minimal and it would avoid any interpolation artifacts along the triangle edges. The second is pretty much the opposite however as rather than rendering a geometric sky sphere around the planet onto which the atmosphere shader is placed I wanted to have the sky rendered as part of the skybox. The skybox is simply a cube centred on the viewpoint rendered with a texture on each face to provide a backdrop of stars and nebulae, as this was already filling all non-terrain pixels adding the atmosphere to that shader seemed to make sense but as the geometry is so low detail computing some of the scattering shader in the vertex shader didn't seem like a good plan as I felt visual interpolation artifacts were bound to result. Bear in mind that this only really makes sense if the viewpoint is generally close enough to the terrain that the skybox fills the sky - i.e. within the atmosphere itself. 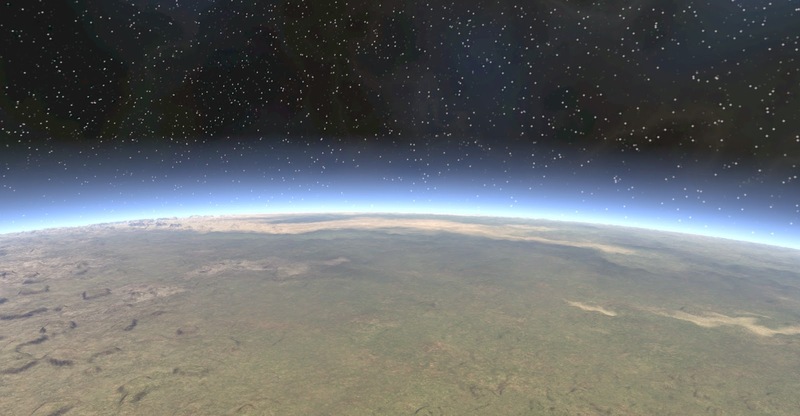 Were I planning to have the viewpoint further away for appreciable time so the planet would be smaller on screen I would instead add additional geometry for the sky to prevent incurring the expensive scattering shader on pixels that are never going to be covered by the atmosphere. Much closer to the surface the stars are only barely visible. Keeping descending and they disappear altogether leaving a clear blue sky. I think that pretty much covers the terrain visuals, probably in more detail than I initially intended but I think it's useful to get the fundamentals sorted out. I reckon what I have so far should be an interesting enough basis to work forwards from. Awe inspiring. Now when can we test it?! Give! Seriously though, very interesting read. Thank you for taking the time to write it up. *DO* you have plans to let the fawning masses (i.e., us) to play around with some version of your engine? 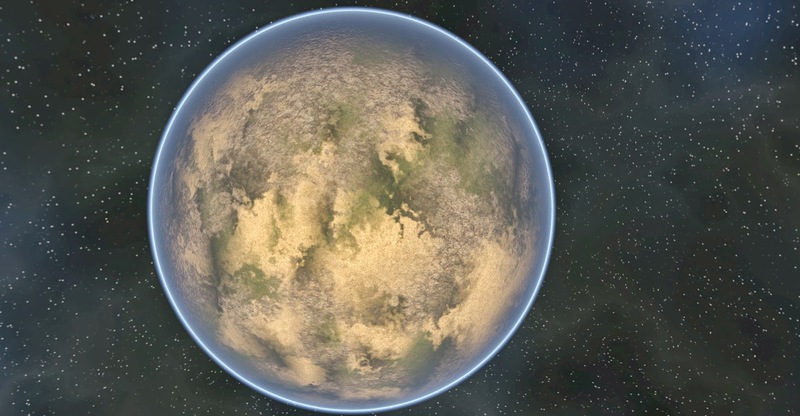 I imagine it would be extremely satisfying to orbit, land, take off and fly around a randomized planet. Perhaps one randomized based on an editable config file of some type. Just a thought! Take care, and looking forward to your next update.